To lock a tool onto the GP-1 all that is needed is a short piece of chain and a "cold shut" link installed into one of the racks many attachment points. Due to varying designs and different shapes/sizes of equipment an optional "H" Strap Kit is available for greater customized security of your tools. This kit is required for securing backpack sprayers when the GP-1 is used on open trailers. 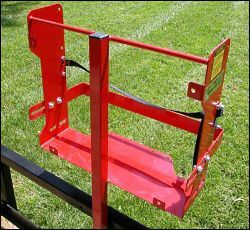 The product Trimmer Trap Dual Backpack Blower Rack DB-1 has been added to comparison list.